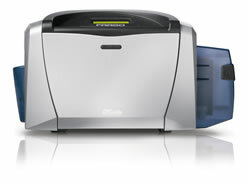 Need technical assistance with your Fargo DTC550 printer? Many of the resources you need, such as current drivers and firmware, are easily found on the Fargo technical resources site. Workbench – This is a utility that provides security, diagnostic and firmware upgrades. With this download is the ability to develop password controlled access to your computer, locate sample Fargo cards, and obtain printer and ribbon information. Visit the Fargo technical support page to locate the above items. For additional information about the Fargo DTC400e or other Fargo printers, let our id card experts provide you with a free consultation. This entry was posted in Fargo Printer and tagged Fargo DTC400e, Fargo DTC400e technical support, Fargo technical support on September 2, 2008 by SafeCard ID Team. Download the latest print driver and firmware from http://www.fargosupport.com. Install the firmware with the Fargo Workbench found in the print driver.